Headlines predicting $140 or $125 a barrel oil prices as a result of the Sunni insurgency in Iraq and the possible three-way split of the country are far from being unduly alarmist with prices touching $116 last week, already up 10 per cent since the start of this crisis. Over the last 40 years every oil crisis has been followed in short order by an economic recession in the industrialized world. Oil prices have also been highly significant for equity markets. As recently as 2011 and 2012 it was a surge in the price of oil to near $125 that brought sharp corrections in global stock markets. Only this time may be different. The geopolitical crises unfolding in Iraq and also the Ukraine do not look like passing convulsions. Iraq’s government in Baghdad seems to be losing its will to survive or at least command the forces supposedly under its control. The Sunni insurgency is a wider movement of many tribes, not just the vicious ISIL that the media focus upon. At the same time the new government in Kiev naively stretches out its hand for help to the EU while not realizing what will happen if it does not start to kow-tow to the Russians.Another common term using in investing and trading is expected return. Every trader or investor has some return that he expects on every single trade that he takes. This is a very straightforward concept in this content which means how much money you think you will make by taking this trade. Last week tanks crossed the border and yesterday Moscow moved its most advanced fighter squadron close to the border and mobilized troops in central Russia. These are war preparations, nothing less. In this unstable world where do you put your money? Into stock markets priced for a solid economic recovery? Rising oil and gas prices will derail an already weak and anemic economy. Overvalued stock markets have a long way to fall. Bond markets will gain in the short-term but what of central banks now prepared to push interest rates into negative territory as the ECB has done? It’s another dangerously unstable investment bubble. Bond investors could quickly be sliced and diced as fast as equity investors. No the real winners will be investments in silver, gold and oil that will soar in price as investors crowd into this trade. Exactly how best to invest in these asset classes will be a subject for analysis in the next issue of the ArabianMoney confidential investment newsletter (subscribe here). 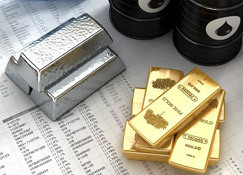 Previous PostGold and silver prices break out as a classic hedge to inflation from rising oil prices and money printingNext PostIs gold going to be an effective hedge in the next global financial crisis?